WHILE studying horticulture 16 years ago, Graeme White and Veronica Cougan discovered a mutual love of native plants and Aboriginal culture. These interests led to a passion for bush foods, and a creative concept was born. 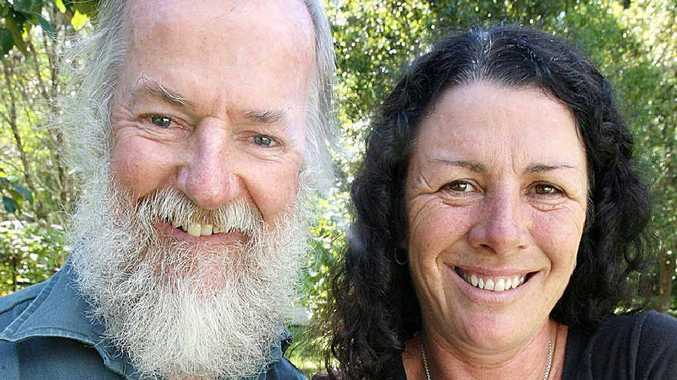 Graeme and Veronica established Witjuti Grub Bushfood Nursery in 1996 on a property in Kenilworth, sandwiched between the state forest and the Mary River. They specialise in quality native bushfood plants for the home gardener and commercial grower. Varieties are selected for their superior fruiting and leaf qualities. Most of the plants they grow are native to South-East Queensland. Some plants are from further north and from northern New South Wales, and are chosen because they do not have the potential to become rampant outside their own environment. Graeme and Veronica have helped establish bushfood gardens in more than 50 schools and on hundreds of private properties and have consulted with many commercial bushfood orchards. It is estimated there were more than 5000 different bushfood plant species across Australia utilised and harvested seasonally by Aborigines. And today, these native foods are being rediscovered by contemporary Australians and used in ways as varied as our multi-cultural backgrounds. The growing and use of bush tucker plants has seen a resurgence in recent years, and much of this has come about through those who are passionate about the plants and know how to use them. Originally, the main bushfood industry targeted tourists and Graeme and Veronica were disheartened to think that foreigners knew more about the native foods than Australians. At Witjuti Grub nursery, their aim is to educate the public about the varied applications and uses of bushfoods and introduce people to unfamiliar species. Graeme and Veronica want to challenge the perception of bushfood as solely survival food and encourage people to embrace the flavours and incorporate them into everyday meals. "There are now many chefs excited about and using bush- food flavours and I think that once someone has tasted a well-prepared meal with our native flavours, they also become excited about growing some of the trees for themselves," Veronica said. The green-thumbed pair warns that many native flavours are much more intense than the domestic ones we are used to, so they advise home cooks to begin by adding small amounts to cooking until a sense of the measure can be gauged. Graeme and Veronica say that the ingredient of the moment is without a doubt the finger lime, which many people call citrus caviar. Like little glistening pearls, the finger lime comes in various colours and adds a fresh burst of lime to many dishes. It also makes a beautiful garnish, and is a perfect pairing for a cold beer. Graeme and Veronica guarantee that a bush-food garden will harvest an abundance of nuts, seeds, fruits and leaves. In season, some can be eaten straight off the bush. Others species will need a little preparation to bring them to their full potential. The tart davidson's plum lends itself to a great chilli plum sauce. Leaves with the taste of lemon, aniseed or a hint of curry or the sweet tang of the Millaa Millaa berries straight off the vine ... the bush-food garden is truly a feast for the senses. For more information, contact Graeme and Veronica on the website: witjutigrub.com.au. In a medium-sized stainless-steel saucepan, combine the plums, water, orange juice, sugar and cinnamon sticks. Place over a medium heat and gently simmer for 20 minutes. Remove from the heat, discard the cinnamon sticks and puree the sauce. Return the sauce to the saucepan. At this stage, add the port and honey, and simmer gently for a further five minutes or until the sauce has the desired smooth consistency. Peel and clean the prawns and cut along the back to open and butterfly the meat. Heat the oil in a wok on a high heat until very hot and add chopped ingredients. Toss and cook for 2-3 minutes. Add prawns, salt, pepper and wine and cook another 2-3 minutes, tossing frequently. Wash and lightly steam warrigal greens and make a bed in the centre of a large dinner plate. Arrange prawns and vegetables on warrigal greens and drizzle over the remaining pan juices. With a fine microplane grater, grate the zest from the finger limes (the skin is very fine,so don't grate the white part). In a small saucepan, whisk eggs. Place sugar, zest and butter in the saucepan and heat on low. It will take about 20 minutes to heat up the mixture slowly and thicken it. Stir frequently so that it doesn't catch on the bottom of the saucepan. In the meantime, cut the limes in half lengthways and, using your fingers, remove all the tiny caviar pearls and place in a bowl. When the butter is smooth and thick, stir in the finger lime caviar. Place in a sterilised jar.